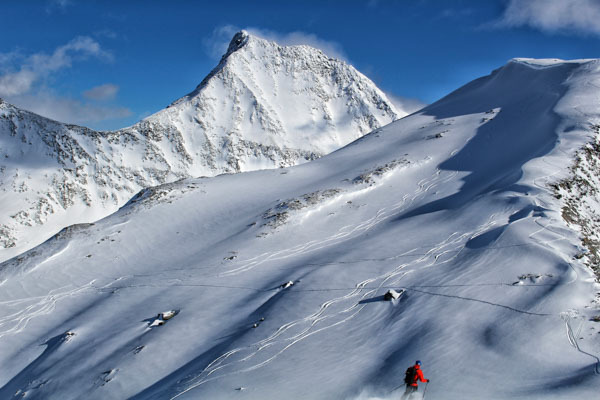 Backcountry ski touring and splitboarding opens up a whole new dimension to the sport, especially in a location as breathtaking as the Canadian Rocky Mountains. Away from piste signs and closure ropes, it’s up to you to make the decision on where to ski, how to get there and most importantly, how to get home safely. That may be easy enough at your local backcountry spot, but venturing into unknown terrain comes with a laundry list of concerns including, but not limited to, the condition of the snowpack, localized weather patterns and knowledge of recently covered hazards such crevasses or bergschrunds. Luckily, there’s a community of professionals that live and breathe this sort of thing. In Canada they’re known as the Association of Canadian Mountain Guides (ACMG). These men and women of the mountains have spent a significant part of their career training and learning about staying safe in the mountains, but the benefits of having them lead your group go well beyond safety. 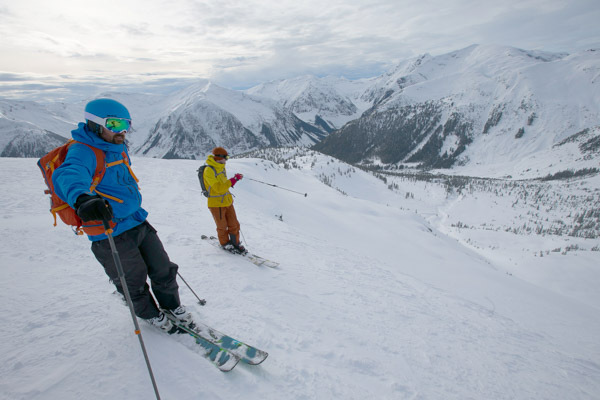 Here’s 7 very good reasons to hire a ski touring guide on your next trip. Even with a good topographic map, compass, GPS and a few hours of Google Earth-ing, there’s no substitute for experience. The backcountry ski touring guide is out in the field every day observing snow conditions, monitoring the weather and sometimes even venturing into previously unexplored terrain. If you want the best bang for your buck in terms of time and effort, a guide will get you to the goods to the very best of their ability. Snow science is one of the most inexact sciences out there. The concept of how snow crystals and layers interact is introduced in entry-level avalanche courses, but qualified guides continuously study the subject and train under avalanche forecasters. Ever tried to navigate through a white-out that suddenly enveloped your blue sky day of ski touring? These men and women make their living out of taking people into the mountains and getting them home safely, so hiring a guide is your best insurance policy. There comes a time when skiers and snowboarders start to look for new challenges in the backcountry. That may look like standing on a remote summit, descending a narrow couloir or completing a multi-day ski traverse over cols and glaciers. 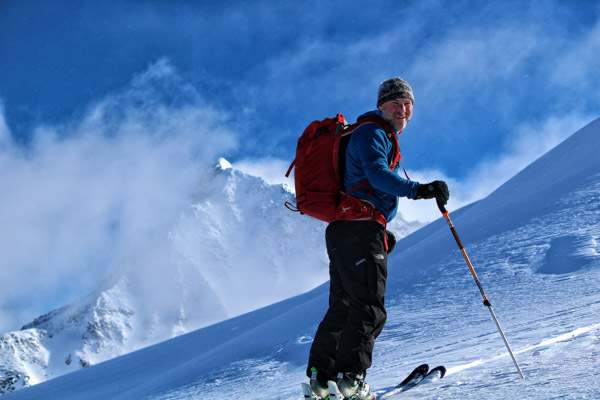 When stepping out beyond your current skill level, knowledge and equipment, a ski touring guide can help you reach your goals sooner without having to learn from making mistakes yourself made along the way. Mentorship is one of the most important steps in every backcountry skier or splitboarder’s career. Someone with a few more years experience and training can pass on their knowledge to you if you spend enough time in the field together. Hiring a guide for every day you go out into the backcountry gets a bit expensive, but if you book in for a multi-day guided trip you can ask questions along the way about everything from snow science to backcountry skiing gear. Meeting a fellow backcountry skier that has completed ski touring trips all over the world always gives you a boost of inspiration and motivation to get out into the mountains more often. Experienced ski touring guides have a seemingly endless well of stories and anecdotes from their careers. It may just be the encounter you needed to start training for that ascent of Denali. 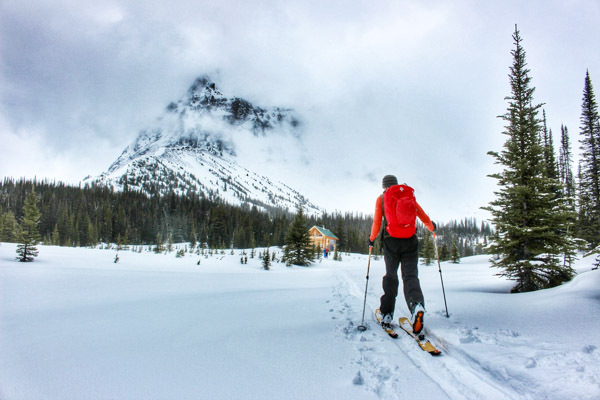 Hut-based ski touring is very popular in British Columbia, so much so that public-access lodges or huts are now often fully booked months or more in advance. The great thing about booking a trip with a ski touring guide is that they often reserve places in public-access backcountry huts at the start of the season, so you are guaranteed a bed. If you’d rather not roll the dice on your local public-access huts being full, booking places at a private backcountry lodge such as the Mallard Mountain Lodge (below) just makes life that little bit easier and your trip a lot more comfortable. Whether an overnight trip or a week-long ski touring experience, your guide will let you get the most out of your lodge-based adventure. A lot of the time people miss their opportunity to go ski touring because their friends or partners have to cancel at the last minute. Guests that book onto guided tours will be grouped with others at a similar ability, ensuring the day always goes ahead as long as the weather allows. You may even make some new friends and ski partners. The goal of most backcountry enthusiasts is to one day have the skills and knowledge to guide themselves in unfamiliar terrain. That process can take years depending on how many times a week you manage to get out in the backcountry during your ski season. If you intend to explore a new area away from your home mountains – one of the most exhilarating parts of the sport – it may be worth hiring a ski touring guide to make sure you have as much fun as possible with the limited time that you have. Learning to ski in the backcountry can be a significant challenge for even the most seasoned of outdoor adventurers. Specialized gear, proper preparation, as well as practical and technical knowledge is essential to begin skiing in the backcountry safely and efficiently. 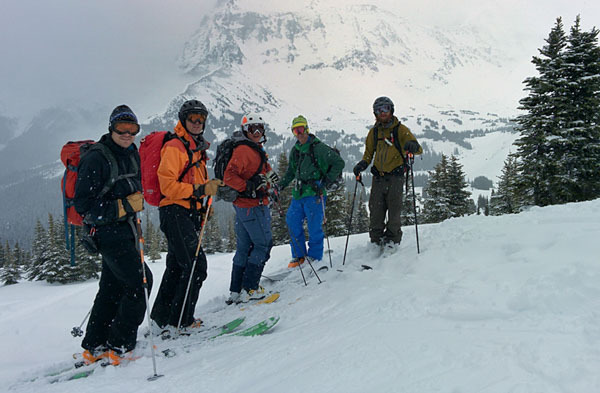 Our ski touring beginners course, AT 101, has been developed specifically to introduce new skiers into the backcountry, to provide you with firsthand knowledge and experience, and to begin your transition into backcountry skiing in a safe and fun environment. If all this talk of backcountry skiing and snowboarding has got you all excited, get in touch and we can help you plan the perfect guided trip. We’re also here to answer any ski touring questions you may have – we’d love to help! Call us on 250-835-4516 or email us via info[at]cacltd.ca.